NIA CHARLESTOWN NEVIS (November 25, 2016) — The Nevis Electricity Company Limited (NEVLEC), with support from the Nevis Island Administration (NIA), has moved one step closer to adding a new engine to its power generating station at Prospect. The formal agreement for the provision and installation of a 3.85 megawatt engine was signed with Wӓrtsilӓ at a ceremony at NEVLEC’s board room on Long Point Road on November 25, 2016. In brief remarks, Premier of Nevis Hon. 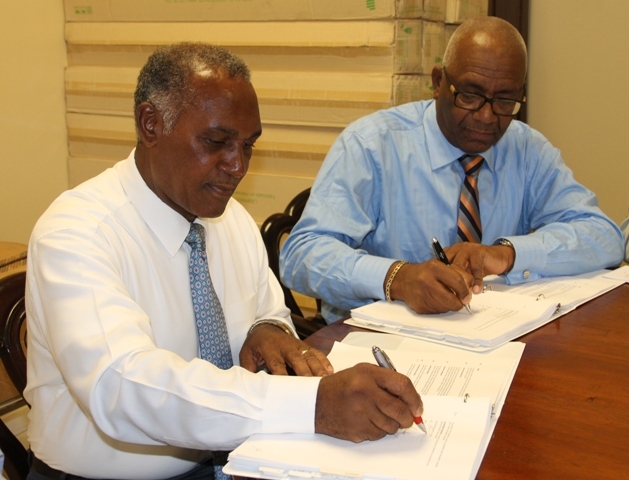 Vance Amory, who also signed on behalf of Minister responsible for Public Utilities Hon. 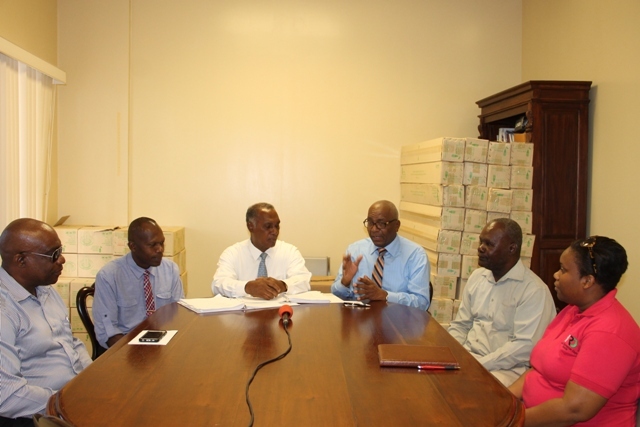 Alexis Jeffers, said the almost US$5million investment will ensure that the people of Nevis have a reliable source of energy. He noted that Wӓrtsilӓ, the company who is manufacturing the new engine, has given a commitment that the engine would be ready for installation by mid-2017. However, in the interim, he explained that provisional steps had been taken to supply the power necessary during the Christmas and tourist seasons. “The decision to have this generating set was made earlier this year because we wanted to be ahead of any difficulty which may have arisen. “The general population would need to know, however, that as a contingency, NEVLEC with the support of the Nevis Island Government, has installed a 2.5 megawatt engine which is a standby arrangement not designed to do long hours of generation,” he said. Meantime, Wӓrtsilӓ representative, Rodney George, Vice President of Wӓrtsilӓ Caribbean, Inc. said he is pleased with NEVLEC’s decision to add a new upgraded Wӓrtsilӓ unit to the existing 15-year-old one at the power plant. George also spoke on the manufacturing of the new engine, which had commenced ahead of the formal agreement signing. “The project has actually commenced…We are very much involved in doing all of the engineering work for the project so that is very well advanced. The production slot for the engine is there. So there’s no issue there. “The generator has been ordered because Wӓrtsilӓ doesn’t manufacture the generator part but we do the engine and other components. So it is well on the way and we are confident, we will meet the delivery time which is around mid-year…There is a dedicated project team who was here a few weeks ago and everything is well on the way,” he said. Acting General Manager of NEVLEC Jervan Swanston chaired the ceremony. Also present were Chairman of NEVLEC’s Board of Directors Farrell Smithen, Member of the Board Janesha Daniel and NEVLEC’s Generation Manager Earl Springette.